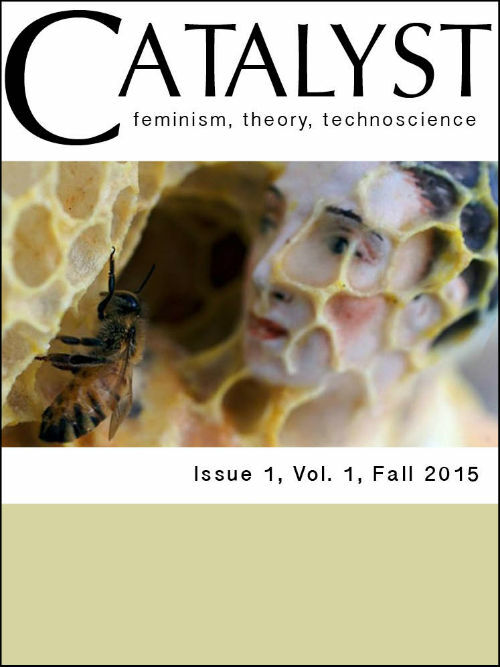 Catalyst: Feminism, Theory, Technoscience is a new online, open-source, peer- reviewed journal that has created a publication platform for the ongoing re- activation and remixing of the field of feminist science and technology studies. Catalyst explicitly embraces work that falls within the rubric of called feminist science and technology studies even as it propagates that work within a broader panoply of geographic sites and disciplines as well as through myriad practices, including art, maker culture, and new media praxis. The journal publishes both conventional monographic articles as well as a variety of experimental writings, roundtable conversations, and digital and new media projects. Moreover, Catalyst recognizes the dispersed, divergent, and intersectional political commitments that constitute feminist STS by purposefully moving beyond gender and sexuality as discrete topics to invite scholarship engaged with militarism, blackness, decoloniality, anti-racism, queer politics, political economy, and disability. The journal acknowledges feminist STS as an intersected, many-sited, under revision, and heterogeneous field. This extensive vision of what might count as feminist engagements with technoscience is signaled by the journal’s name. Etymologically, the word “catalyst” is constructed out of the Greek word katálusis, which means “dissolution.” This sense of coming apart, or coming undone has been reversed in the contemporary usage of the term in social and political discourse, where to catalyze means to stimulate social change or precipitate an event. Catalyst embraces the word’s contradictory associations, including its use as a technical term within chemistry. In chemistry, a catalyst is a substance that increases the rate of a chemical reaction by changing the amount of activation energy required without itself undergoing any permanent chemical change. The addition of a catalyst, in other words, sparks an alternative pathway for a chemical reaction to occur. In practice, this means that a catalyst can be used to trigger a reaction that would otherwise not happen because it requires too much energy. In other words, a catalyst stimulates other routes and relations. Drawing on this plurality of histories and meanings, the journal mobilizes the word Catalyst to describe the task of supporting the ongoing remaking of feminist STS constituted in the uneasy mixture of many trajectories of critical thinking, and towards the political project of a changed world. For instance, tracing an historical itinerary for the term “catalyst,” one could route through the work of the Scottish female chemist Elizabeth Fulhame, who in 1794 published An Essay On Combustion with a View to a New Art of Dying and Painting, wherein the Phlogistic and Antiphlogistic Hypotheses are Proved Erroneous, a text credited with the first description of a chemical catalyst. Aptly, Fulhame’s work in chemistry took as its experimental concern artistic practices, studying chemical processes used within photography, dying, and the creation of metallic fabrics. Thus, routed through Fulhame, the very genealogy of the concept of catalyst brings together the entwined histories of science and art practice, as well as the creation of technoscientific projects in the margins of imperialism and patriarchy. The desire to create Catalyst came from the acknowledgement that scholars in feminist STS consistently struggled to find journals amenable to their work, and that this especially affected younger scholars who were often undertaking their research in the marginal corners of more conventional disciplines. Thus, it was important to the editorial board that Catalyst be a peer- reviewed journal that would strive to publish work at the cutting-edge of the field. With these ambitious in mind, Catalyst is also a project built out of the labor of a small circle of academic colleagues and graduate students who work transverses the areas of feminist, queer, postcolonial, and antiracist STS and media studies in the US and Canada. The development of Catalyst was not launched by a professional society or academic press, but instead was created out of the work and commitment of people drawing on local and ephemeral sources of funds at their various universities. The journal is made possible by graduate student labor and creativity from UC San Diego, NYU, Emory, UCLA, and the University of Toronto, as well as a modest one-year grant provided by the Society for the Social Studies of Science (4S). Thus, the journal currently straddles DIY feminist praxis, where unwaged labor is mobilized to create possibilities otherwise institutionally foreclosed, and a commitment to scholarly rigor and recognition of work in the field. We are keenly aware that our own composition of US and Canadian academics provides only a partial entry into the efflorescence of critical feminist STS work, and that our itineraries of feminist, anti-racist STS have emerged from particular resistances to American empire and settler colonialism, which are not necessarily the points of departure for critical, political, feminist scholarship generated in other locations. This self-reflection is another reason to embrace the name Catalyst, as a recognition that the work which is submitted to the journal may very well spark a rearrangement of the very terms and boundaries of constitutes feminist STS. For each special issue, Catalyst has instituted a practice of putting out a wide call for papers that seeks to expand beyond collegial networks and invite interventions into the questions it poses. While all these special issues are purposely crafted to spark the ongoing remixing of feminist STS, Catalyst also invites the submission of individual papers and digital projects looking for a platform from which to stir up of technoscience, feminism, theory, and politics. We hope scholars at EASST and beyond will view Catalyst as a forum where they are welcomed and challenged to the continual remixing of feminist technoscience studies.